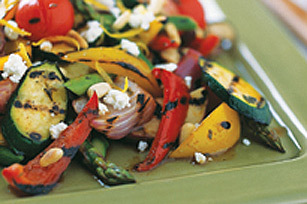 Summer and Fall are perfect times for this grilled vegetable salad. This is a really wonderful and nutritious way to use fresh asparagus, corn, peppers and ...who doesn't need to use all the zucchini we have available in the Fall! In part, this vegetable salad is delicious because of the Balsamic Vinaigrette Restaurant Salad Dressing Recipe which is also on the website, just a click away. (Click the link). The vinaigrette dressing makes this vegetable salad recipe a favorite restaurant recipe. Preparation time: 30 minutes. Serves 4-6, depending on portion. Note: You can substitute whatever vegetables you have or like. I often add grilled mushrooms, for example. A favorite addition is Portobello mushrooms! (The spellings "portobello", "portabella", and "portabello" are all used, but the first of these spellings is apparently the most common. That's it! A YUMMY Vegetable Salad! Good job! 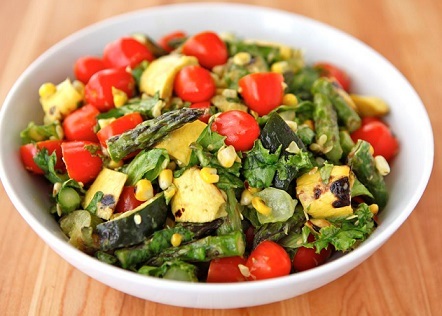 Enjoy your grilled vegetable salad and the company of those you share it with!